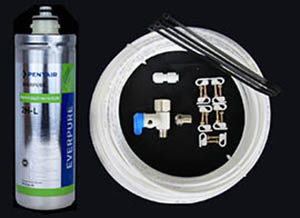 The Everpure S-54 Filter Cartridge, Filter Head & Water-Line Install Kit is specifically designed for the Clover D7A water cooler, Clover D7B water cooler, Clover D14A-B water cooler & Clover D16A-B water cooler. It provides the complete parts needed for installing a water filter and head for your Clover bottleless water cooler, as well as complete parts to install a water line from your water source to your bottleless water cooler. The S-54 Filter Cartridge (also known as the Everpure 2HL) is manufactured by Everpure, a 49-year-old, US-based filter company that makes high-end, commercial grade water filters. The S-54 fits a quick-change head, so changing the filter is as easy as changing a light bulb. Learn more about the S-54 Filter's (Everpure® 2HL) technical specs, and what this filter removes from the water by downloading our PDF.